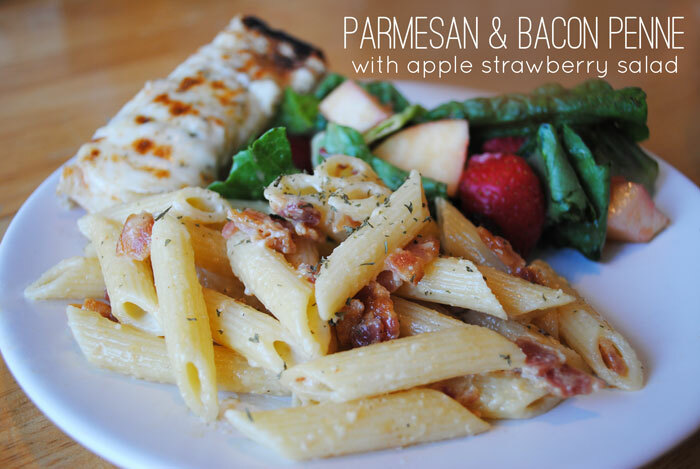 After a long wait, we have another recipe to share on the blog. And what a good one it was. This meal hit all of the right tastebuds and was fairly simple to throw together. For a collaboration meal with our friends over at C&C’s Kitchen, we wanted to prepare a little extra something, rather than just one dish main dish. 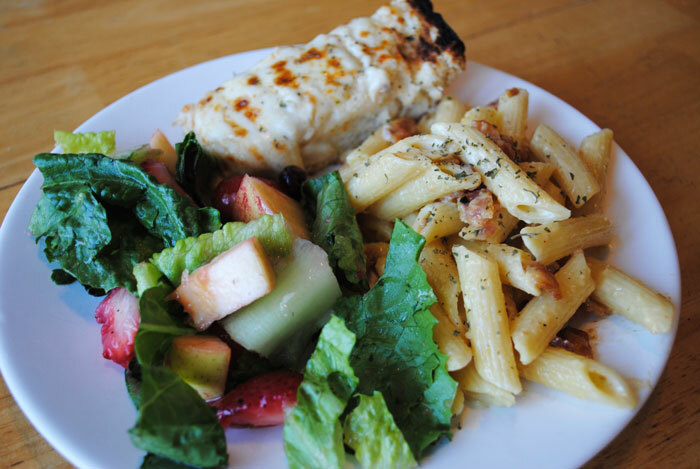 So here we have a creamy pasta dish, a sweet and fruity salad, and some warm, cheesy garlic bread to finish it off. This is definitely a meal that we want to repeat…..again and again. 1. 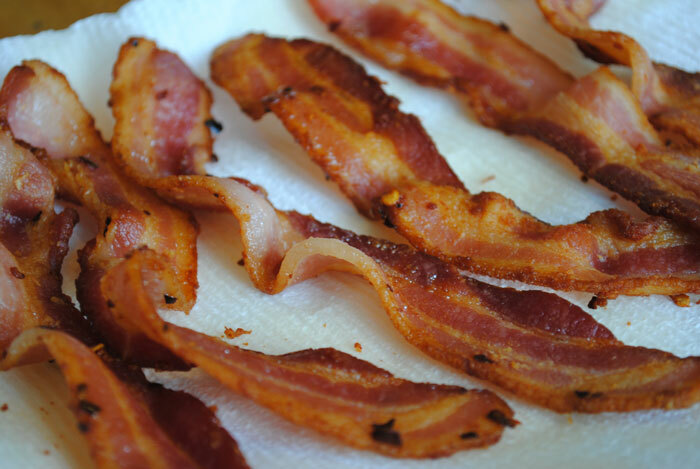 In a skillet, fry the bacon with red pepper flakes generously sprinkled on top. Place on a paper towel to soak up the grease and cool off. Chop or crumble the bacon and set aside. 2. Cook the pasta in salted boiling water (according to package instructions). 4. Drain the pasta and return to pot. 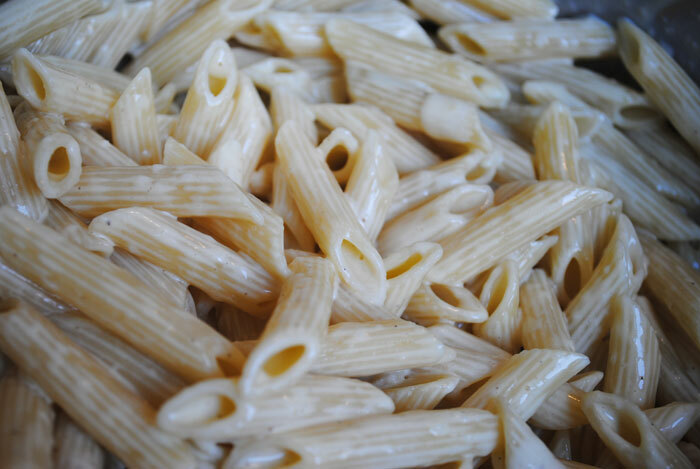 Pour the sauce mixture on the pasta and stir to distribute evenly. Because the original recipe is very basic, this is the time that you can get creative and add to it according to your own taste. We decided to keep it simple, but some cherry tomatoes, pesto sauce, or even grilled chicken can be added to the mix. Feel free to experiment, and let us know what worked for you. 5. 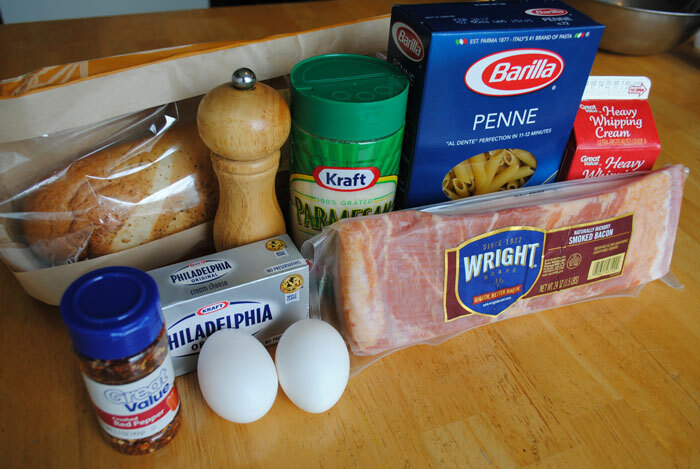 Add crumbled bacon (and any other extras) into the pasta. Sprinkle with oregano. 2. Slice a few strawberries and an apple or two (with the skins on!) and add to the lettuce. Sprinkle dried cranberries and chopped pecans on top. 3. Drizzle raspberry vinaigrette on top of your salad and toss until lettuce is coated. Of course, this will depend on your taste, but keep in mind that this vinaigrette is sweet! Serve cold. 2. Cover both sides with shredded mozzarella cheese. 3. Place in a preheated oven of 350 degrees and bake for 10 minutes or until cheese is melted and the bread becomes toasted. (Leave the loaf open and the mozzarella exposed while baking). Browning cheese on the top is a good indicator that your garlic bread is done. 4. Remove from oven and let cool for 5-10 minutes before cutting into slices (otherwise the cheese will get messy). Serve warm. What is your go-to meal when throwing a quick and delicious meal together? Favorite side dish? This salad definitely takes the cake for me. Stay tuned for more recipes, sketches, and crafts in the future. We can’t wait to make even more cool stuff!